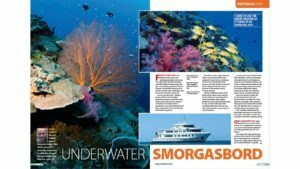 Nigel Marsh visited one of the most remote dive destinations in Australia aboard the mighty TRUE NORTH and discovered a collection of corals, fish and sharks that blew his socks off! From my first dive at the Rowley Shoals I knew I was exploring somewhere very special. For a start, there were fish everywhere - colourful reef fish and large pelagic fish, plus a very healthy population of sharks. However, because these creatures see so few divers at this remote destination, they proved to be extremely camera-shy. Less shy were the corals - fabulous gardens of hard corals, beautiful gorgonians and spectacular fields of soft corals. I hate to use the word "pristine" as it tends to be overused and not appropriate to most dive destinations, but this was the perfect word to describe this underwater smorgasbord.